The December exhibit at our Gallery at the Garden features photographs of Vermont’s organic farming pioneers by John Nopper, along with photos from the Brattleboro Food Co-ops long-running “Producer of the Month” series. They were, in fact, reviving a way of farming that the Green Revolution had all but killed off. They learned how to grow vegetables and raise livestock in a difficult climate and topography, without pesticides or chemical fertilizers. They learned how to grow food that was good, and good-looking. Eventually they became successful commercial farmers and leaders of organic agriculture, in Vermont and elsewhere, pioneers who created an industry— its production, marketing and distribution-—and a culture from the ground up. 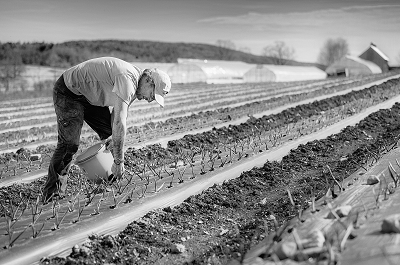 Together, these farmers’ lives are the backbone history of organic farming in Vermont. Theirs are important stories that we don’t want to lose. 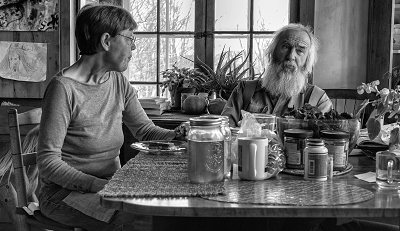 Vermont’s Organic Farming Pioneers tells their stories through photographs and text. John Nopper came to Vermont as a teacher, worked for many years in the wood industry, and then built and managed a large-scale sheep operation on his farm in Putney, Vermont. Currently he operates a commercial hay business, and now has the time to develop his interest in photography. Susan J. Harlow is a long-time agricultural writer, magazine editor, and author of a recent history on the University of Vermont Extension System. She works at Antioch University New England and lives in Westminster, Vermont, on Harlow Farm, where she grew up. The Co-op’s “Producer of the Month” series features color photos of many of the farmers and producers (ranging from choclateers to cheesemakers) who have been profiled in the store’s monthly series. The photos were taken by several of the Co-op’s graphic designers. The Co-op is a long-time sponsor of Strolling of the Heifers. The Gallery at the Garden is at the Robert H. Gibson River Garden, 157 Main Street, Brattleboro. The exhibit will be open during Gallery Walk, Friday, Dec. 5 from 5:30 until 8:30 p.m. The Gallery is open otherwise Mon.-Fri. 9-5, Sat. 11-5, Sun. 1:30-3:30.